It looks as if the book store as we know it is doomed. National statistics on book stores show that they peaked, in terms of number of stores, in 1994 and have been pretty much falling in number ever since. Now, these data only extend through 2007 (data for years after 2007 in the chart are forecasts only). That means that the impact of the “Great Recession” is not captured in these data, nor is the rapidly growing impact of eBooks. Nonetheless, we see that a downward trajectory had already set in before 2007. The chart also shows another pattern, namely the pattern of growth in the size of stores over this whole period. On average book stores employed 6 people per store in 1982 and by 2007 they employed 14.5 per store (shown as blue dots on the chart). So, in the 1980s book stores were humming along, their numbers stable or growing slightly but their per store size remained reasonably steady. We know that the large book stores were already busy acquiring existing stores and expanding their holdings, their retail chains. 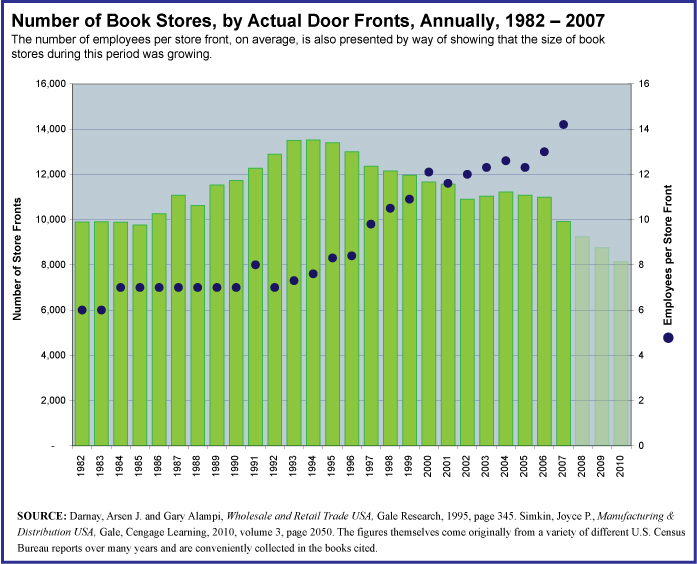 But, it wasn’t until the 1990s that these big book stores started to have an impact on the average size of book stores. This occurred when they began consolidating stores and expanding some into the big box super stores outlet that were so typical of the retail sector generally in the 1990s. This we can see by the rising average number of employees per store which starts in 1990 and never stops rising. Independent book stores have been struggling for years. An Internet search for articles about “book store closings” will produce a mind-numbing list of stories about the demise of independent booksellers of all sorts and kinds, many quite well-established institutions in their communities. The articles date back, for the most part, to the mid 1990s, to that spot on the chart where the bars begin to decline. What has changed about the flood of book store closings in the last couple of years is the fact that they are happening across the sector. The independents continue to close in large numbers but now so do stores that are part of the big book store chains. While there is a lot of talk about eBooks these days, the fact is that at 3% of the market in 2009 they were not yet a large enough part of the market to have played a big role in the dramatic decline of book stores through last year. It isn’t eBooks that are killing off book stores (at least to date) it is the complete restructuring of the book distribution business. Two things explain the shift. The online sale of print books and the ready availabilityof all the best sellers—at big discounts and in huge numbers— in general merchandising outlets everywhere; Walmart, Target, Costco, Sam’s, etc. What seems clear is that while we moan, complain, protest, and cry about the loss of book stores, we are—the book buying public—actually unwilling to pay a little extra for books in order to maintain all the other benefits that come from having a book store near by. Then again, it is human nature to take things for granted until they’re gone. Nonetheless, we appear to be a people who will shift our buying patterns to save a buck pretty easily. Into this retail environment we add the whole issue of eBooks. The signs of impending doom only get clearer. This is the daunting future that has booksellers concerned, and publishers too. 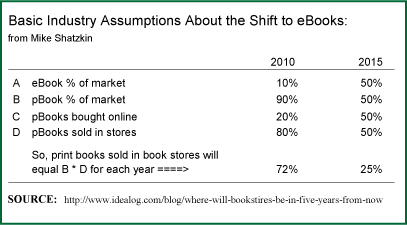 In a very interesting article on this subject, available here, industry analyst Mike Shatzkin presents some numbers—calculates what current industry assumptions about the shift to electronic books will really mean to book stores. Given these assumptions, by the year 2015 bricks-and-mortar book stores can be expected to see their portion of the market shrink to 25% of all pBook sales (that’s print books and doesn’t include the book stores’ own electronic sales). That represents a two thirds drop in market share, from approximately 72% of the market to 25% of the market in a mere 5 years. No wonder Barnes & Noble and Borders are scrambling to make themselves into online booksellers. But, what is an independent bookseller to do with this sort of forecast? Nick-knacks, greeting cards, and scones will only make up for a fraction of the likely decline in sales. Besides, if many people are using the local book store as a sort of live catalog, good for browsing but not good enough to purchase from, doesn’t it make more sense to start looking into other businesses? This restructuring of the whole system of book distribution has profound implications for publishers too, of course. A good topic for another day. 1- “Locking the Doors for the Last Time,” by Cindy Crosby, available online here. 2- “ Chicago’s great architectural bookshop facing the end of its own long story,” Chicago Tribune, available online here. 3- “Tough times, but some bookstores have a different story – Some face closure, while others expand,” by Vit Wagner, published in The Star (Toronto, Canada), available online here. 4- A reader’s reply online to the article “Pages Books of Toronto to Close,” by Core Doctorow, available online here. « Reading in Color, Why is this such a big deal? And now bye-bye to picture books for children. One might wonder if those picture books wouldn’t work better for the adult market.